If you go by the odds, Christy Stevens shouldn’t be alive right now. An Omaha police sergeant and mother of four, Stevens spent a total of 12 weeks in the hospital during the past year dealing with brain tumors, strokes and a potential heart collapse. To those who know her, though, it wouldn’t have been a surprise to see Stevens’ indomitable spirit power her through the medical hardship. “She’s a fighter and she told everybody from the beginning that she was going to fight to the end, and she told the doctors, ‘I don’t want to die on the table, I have four children I need to take care of, and I’m going to fight every way through this,’” Kathy Gonzalez, a police captain for the Omaha Police Department, said. Born and raised in Beatrice, Nebraska, Stevens initially moved to Omaha to attend college at UNO. Not long after, Stevens began to study taekwondo in 1995 under Grandmaster Kim, and the sport quickly became a large part of her life. It took Stevens just two years to earn her black belt and become an instructor for Grandmaster Kim, where she worked alongside Puht Dek. A police officer for OPD, Dek and Stevens became close friends as they both served as taekwondo instructors. Eventually, Stevens also joined Dek on the police force, a job she has been working for the past 18 years, and a job she excels at, according to her coworkers. “Christy is one of the most organized people that I know, she is a perfectionist when it comes to several different aspects in the policing world,” Gonzalez said. After joining OPD, Stevens and Dek also combined for their next big adventure in taekwondo- starting a school together. The pair have served as taekwondo instructors at Dek’s Taekwondo School for the past 12 years, working with a variety of students, including many with developmental disorders. Every aspect of Stevens’ life was thrown off course in April of 2018, when she went to get an MRI after losing vision in her right eye. The scan showed tumors in her brain, prompting doctors to schedule a surgery to remove the tumors. In the pre-op examination, though, the doctors discovered Stevens had pericarditis, which was putting massive pressure on her heart. After having a craniotomy to fix that issue, Stevens underwent surgery to remove her tumors one week later. During the surgery, Stevens suffered a pair of strokes which left her unable to talk as the left side of her body was paralyzed for over a week. “They [the doctors] told my mom I’d never regain use of my left side, that it was dead, that I’d never use it again,” Stevens said. On the road to recovery, Stevens spent eight weeks in the hospital and getting treatment at Madonna Rehabilitation Hospital. After graduating Madonna, another heart issue presented Stevens with her closest brush with death yet. Stevens’ heart was going into tamponade, essentially collapsing due to internal pressure. “I ended up in the emergency room thinking I was taking my last breath and the only thing I could think of was that I couldn’t die at home where my kids could find me, I didn’t want them to have that as their last image, so I needed to get to the hospital,” Stevens said. Stevens underwent surgery to cut a hole in her pericardium to release the pressure on her heart. However, she needed another emergency procedure five weeks later with her heart still in danger of collapsing. After arriving for her appointment, doctors discovered her heart was actively collapsing, requiring them to puncture her pericardium, which ultimately saved Stevens’ life. “The doctor told me that if I hadn’t been on that operating table at that time with the surgical team around me, I wouldn’t have survived,” Stevens said. Despite the many medical hardships she went through last year, Stevens continued to persevere because she knew she had to – not just for herself, but for her four kids. Her four children, Jaylee, Anthony, Dante and EJ, are adopted and all have had to overcome personal struggles of their own as well. It makes sense that Stevens’ children are proficient in taekwondo, as they have been practicing it since they first learned to walk. After practicing taekwondo for so long, Stevens is well-acquainted with the benefits of the sport, traits she wants to pass down to her kids. She said taekwondo has made her stronger mentally, physically and spiritually, and that the sport also provides for personal challenge since you can always improve and get better. In the midst of financial uncertainty, taekwondo also worked as an escape for Stevens and her kids. As a single parent, paying for her many surgeries was a concern for Stevens, to the point where she told her doctors she needed to get back to work. Stevens had accrued some paid leave already, and with support from the union, managed to get enough paid time off to navigate her many surgeries. Now back with the force in a part-time role, Stevens is grateful for the role taekwondo played during her time in the hospital. “They could worry about doing their best at taekwondo and competing, and they didn’t have to worry about the same things I worry about,” she said. 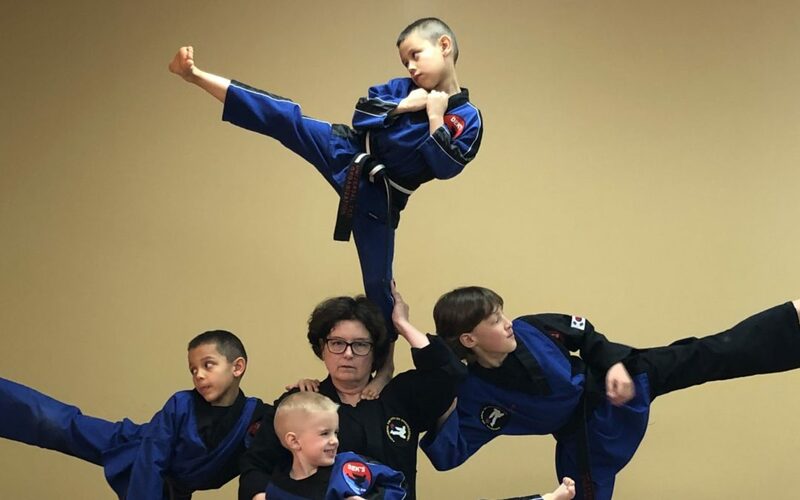 For her kids, they are all experienced taekwondo specialists at this point, with the black belts to prove it. Their favorite way to practice taekwondo isn’t at the studio, but rather at the Cornhusker State Games, in which the family all enjoys competing. Jaylee and Anthony have competed in past years, as they both won gold medals last year, while Dante and EJ will participate for the first time this year. For Christy too, the Cornhusker State Games will take on special significance. Her goal for her recovery is to be able to participate in the taekwondo section of the Games in late July, even if that goal looks far away right now as she is still unable to practice her beloved sport. In light of her many medical issues, Stevens turned to her faith for help and support in the hard times as well. She feels a calling in both of her disciplines as a taekwondo instructor and as a police sergeant, because Stevens has the gift of helping people. That gift shines through in much of her work with OPD and motivated her fellow officers to return the same helpfulness and caring spirit she is known to provide, as they all pitched in with meals, time, support and help with her kids. It speaks volumes to Stevens’ character that even after going through the many trials and physical discomforts she suffered in 2018, she remains positive and simply thankful to be alive. Whether at her taekwondo school or on the streets, Stevens has helped countless Omahans and doesn’t plan on stopping her mission anytime soon.